I don't usually like books about apocalypses, irrespective of the genre (I'm reading The War of the Worlds right now.) They can be predictable, and often, just pointless. But it's a Stephen King book, so it would be wrong if I didn't like it. I wouldn't call it one of his better books, but I was surprised by something which you don't see very often in King's works - a very fast pace. A lot of brutal action starts within the first ten pages of the book. The story gains a momentum that it doesn't lose until the very abrupt and effective ending. Needless to say, the characters are as great as the story. Survivor's accounts, as I said before, can be repetitive and there's not much room for originality. I read somewhere that the book is supposedly Stephen King's homage to zombie fiction; I haven't read enough books about zombies to be able to tell. But whatever they are, the idea of telepathic enemies is a good one, and makes this survivor's tale distinctive. The book has a lot of energy and is a quick, involving read. Once I was done reading it, I found myself revisiting the themes of the book in my mind. The book proves once again, that it is crazy to dismiss King as a genre writer. I would recommend it, though, to only those people who are already familiar with Stephen King: if you've never read any of his books, don't start with this one. I haven't read either of these yet, BUT I am reading Gerald's Game next and I'm kind of excited about it (probably because I've only read one other review of it and it was positive too, and ALSO because the premise sorrrt of reminds me of Misery which is awesome). So thanks for further reassuring me that Gerald's Game is going to be good! 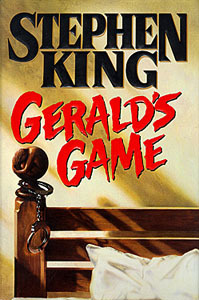 King is one of my favorite authors, I loved Gerald's Game! 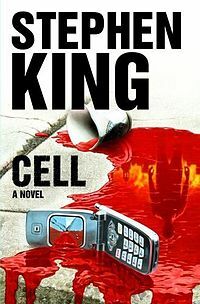 I did feel the same way you did about Cell (good book, but wouldn't recommend it for a first-time King reader). If you haven't yet, do check out 11/22/63. It's another one of those books of his that step out of the "horror" box that people have put him in. I found it in a list of the worst books by Stephen King and it was the first, so I was surprised when I actually liked it. But I guess I'm not the only one, and I bet you'll like it too. Happy reading! I did have "11/22/63" in mind when I said "the book proves once again that..": it's just amazing, isn't it? Thanks for stopping by! My first King book was Carrie (ebook). It's also Kings 1st published novel. I like King. I still have a bunch of his book that I've collected to read. Pet Cemetery scared me the most and I loved the idea behind The Twilight Zone. I've put It aside because it's a big book and the writing is slow but creepy. I mean the book "It"
The only book I've read by King were the installments of The Green Mile. Only after my husband assured me it wasn't scary. I did end up loving it.